You have wonderful collection of music which I enjoy listening to immensely keep collecting. I was wandering if with each Rag rendered you are able make the Bandeshi available. It will enhance the enjoyment of the rendition that much more intense. At times it is not very clear what the singer is using especially when they mix bandeshi with akar. 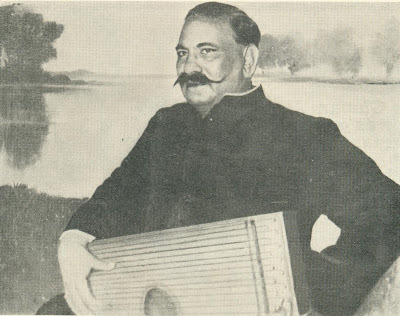 USTAD BADE GHULAM ALI KHAN SAHIB. TRULLY A ” GHANDARVA ” REINCARNATED. Keep up the wonderful work…..
Ustad Bade Gulam Ali Khan is my favourite. Hear the Raag Malkauns(drut) and you will feal as if you are in heaven. Ustad Bade Ghulam Ali Khan saheb was an artist by soul. I would like to thank sarangi.info for providing such great & rare records to the classical music lovers……. This ladies and gentleman, is the end. Interview with late Maestro of Indian Classical Music Ustad Bade Ghulam Ali Khan not found. Please look into it. Thanks, your effort is truly praiseworthy. I was also looking for the Interview of Ustad Bade Ghulam Ali Khan. It was not found and the site gives 404 error. Pls look into it and get the correction done. Thanks, your service to the Classical Music is greatly appreciated. Saranfi.Info I have no words for this effort…. Thanks a lot for this precious Gift. Bade Ghulam Ali Khan is the greatest vocalist of our times. His heavenly voice makes the atmosphere so serene and pure. I am thankful to everyone who brought his music to our lives. bade ghulam ali acha gatay thay aur yh baat bohat mazay ki hay kay awam aur khawas dono mein maqbol huay shayad yeh kusoor gharanay ka khasa hay bade ghulam ali patiala kay baad mein huay paida kusoor mein huay thay. baba bullay shah sufi poet bhe kusoor mein mudfon hain. madam noor jahan bhe kusoor ki thein.